Mia Annello with the 55-pounder she grew in a sunny spot in her Billerica yard. Nine-year-old Billerica resident Mia Annello couldn’t have carried her prize-winning cabbage even if she wanted to. The vegetable weighed a whopping 55 pounds — only 7 pounds shy of Mia herself. The agricultural feat earned Mia, now a fourth-grader at Thomas Ditson Elementary School, a $1,000 prize. “I was jumping up and down,” Mia recalled, when her mom told her the news. Mia was this year’s Massachusetts winner in an annual national cabbage-growing contest held by vegetable retailer Bonnie Plants, beating out 6,589 participants statewide. The Alabama-based company started the cabbage contest in 1996 to instill an interest in gardening with children. The contest is open to third-graders enrolled in elementary schools in the mainland United States. 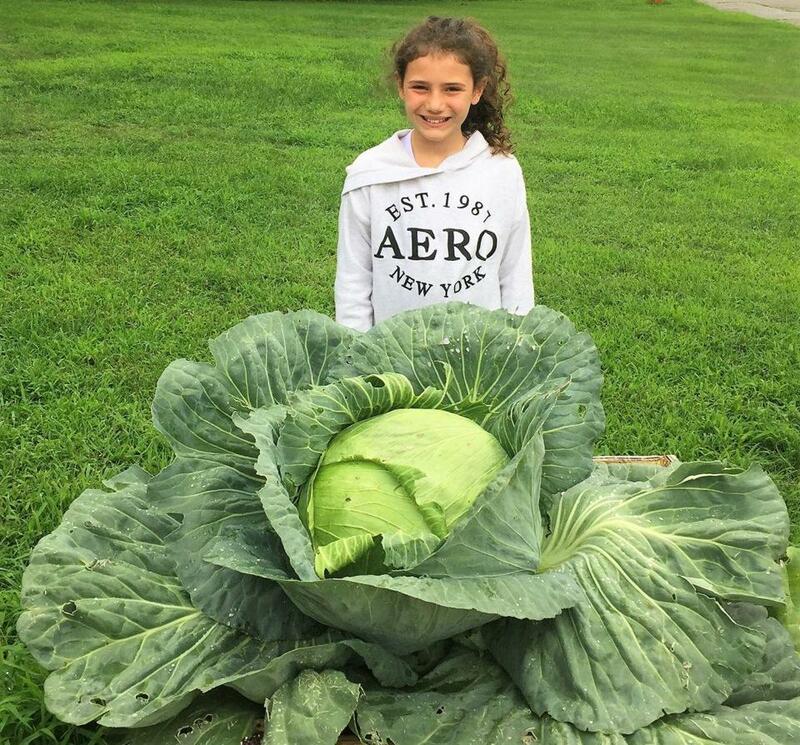 Each school picks the best cabbage based on size and appearance and submits a picture online. From there, all the top state entries are put into a drawing and a winner is randomly picked. Each state has one winner who receives a $1,000 bond that the company recommends be reserved for college. Approximately 1 million students participate annually, according to Bonnie Plants. Once a class registers, the company supplies an O.S. Cross cabbage plant to each participant. The hybrid breed is known to grow to large proportions, which Bonnie Plants thought would grab young gardeners. Mia took her plant home in May. “I told my mom and she goes ‘what? !’ She said we would have to call my grandfather because he knows a lot about gardening,” Mia said. Her mom, Lisa Annello, her grandfather, Joseph Annello, and Mia chose a bright and sunny patch in her front yard for it to grow. The open location spotlighted the monstrous plant, luring in curious neighbors and sparking conversation with guests. Mia’s grandfather helped her fertilize the plant once a week, and Mia watered it twice a day. The excitement Mia felt matched the rapid growth of the cabbage. She e-mailed her former third-grade teacher Kathryn Maes throughout the summer with updates. “We would go outside every day and I got more and more excited because it just kept getting bigger and bigger and it didn’t stop,” Mia said. “She didn’t think it was ever going to stop growing,” her mother said. The Annellos dislike the taste of cabbage, however, so when the time came to harvest it in August, Mia’s father brought it to work and divided it up among a group of coworkers. Thomas Ditson Elementary has participated in the cabbage program since 2001, according to Maes. A total of 86 students were given cabbage plants to grow at home last year. “I was really surprised. I’ve never had a student win before,” Maes said. Current third- and fourth-grade students at Thomas Ditson will be invited to attend a special ceremony honoring Mia, where a representative from Bonnie Plants will give her a big fake check and her parents the bond. “It does afford kids really valuable life lessons in responsibility, in nurturing nature, in their own personal accomplishment,” said Joan Casanova, a spokeswoman for Bonnie Plants. In fact, Mia, wouldn’t identify herself as a gardener before, but she admitted her passion has grown. She’s already plotting for this summer.